I am so ready to wear cute summer dresses but with more snow in the forecast for tomorrow I doubt I will be wearing a cute sundress anytime soon! 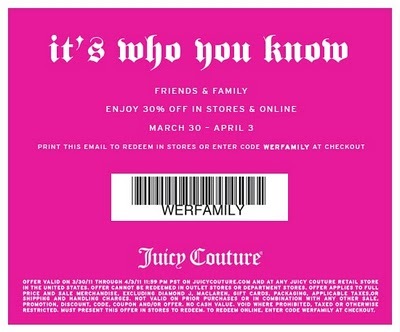 I am sure many of you received this coupon for Juicy Couture this week as well. I found several cute items from the Summer 2011 line and all of these adorable items can be pre-ordered. My favorite item from the new line is the red striped maxi dress.